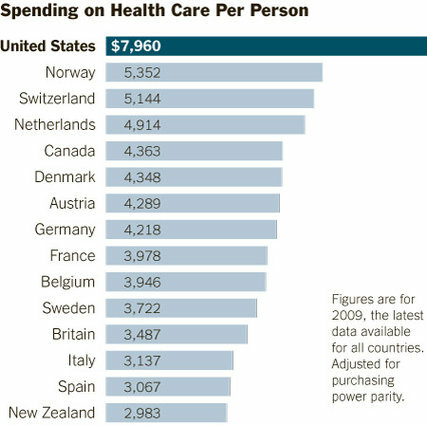 The truth is, the United States is not getting 20 or 30 percent better health care or results than other countries. While there are peaks of greatness, especially at some of America’s leading academic health centers and in integrated health care plans, the quality is uneven. And quality is a problem that affects all of us, rich and poor. Almost no matter how we measure it — whether by life expectancy or by survival for specific diseases like asthma, heart disease or some cancers; by the rate of medical errors; or simply by satisfaction with health services — the United States is actually doing worse than a number of countries, like France and Germany, that spend considerably less. About half of all the health care dollars spent comes from the U.S. government. Which means that if we simply got over our hangups about “European” social programs and adopted the health care system of, say, France, we could have universal health care in the United States with no increase in the amount of money the Federal government is already contributing. And get better health outcomes. The fact that we don’t is all you need to know about how ossified and absurd our thinking is on health care, and how the lobbies for the status quo have corrupted Congress and are stealing us blind. very nice. Weren’t ‘Ossified and Absurd’ on Amos ’n Andy?